Technology that could improve orientation control for spacecraft is the latest commercialization project to receive seed funding through the Launch program at New Mexico State University’s Arrowhead Center. The adaptive singularity-free control moment gyroscope technology was developed by Amit Sanyal, an assistant professor of mechanical and aerospace engineering at NMSU, along with doctoral candidate Sasi Prabhakaran. Engineering master’s student Taylor Burgett, a client of Arrowhead’s student incubator, Studio G, is working to commercialize the technology for use in cube satellites. Control moment gyroscopes are internal momentum-exchange devices that are used to control the orientation of a rigid body in space. Comprised of novel hardware and software architectures, the gyroscope technology provides precise attitude control and stabilization and is scalable for vehicles ranging from nano-spacecraft to crafts as large as the International Space Station. The technology has additional applications beyond spacecraft, as well, including in rockets, cars, robots, ships and even health care, Burgett said. The Launch program helps transition early-stage research projects into marketable products by exploring a technology’s commercial potential very early in development and providing funding and resources for that work. Jason Koenig, Arrowhead’s director of entrepreneurship and commercialization, who oversees Launch, said the program has a new format in this, its fourth year, awarding work space and $5,000 in kick-off funding to each of six finalist projects, which then received four months of intensive development and mentorship to assess and validate technologies, explore customer development and identify investment opportunities. 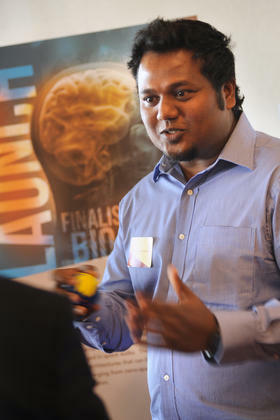 The six projects then competed for the opportunity to win seed funding of up to $25,000. Burgett said it means a lot to have their technology and business model chosen by judges who have proven themselves to be successful entrepreneurs. • A high-voltage programmable current regulator developed by NMSU electrical and computer engineering associate professor Paul Furth, which provides a lightweight, low-cost, high-speed alternative in a range of sensing and testing environments, including chemical weapons, explosives and drug detection and air quality monitoring. • A weight-balanced test stand for testing micro air vehicles or small unmanned aerial vehicles, developed by NMSU mechanical and aerospace engineering professor Ou Ma to use as a power-efficient system for MAV and UAV testing. • An innovative photoreactor process using nanocomposite photocatalyst fibers for water treatment and disinfection, or photocatalysis, developed by NMSU civil and geological engineering research associate professor Huiyao Wang. The process uses solar energy to remove toxins and pathogens from water, offering a green alternative to traditional water treatment systems. • Flooid Lingo, an online social media platform developed by Christopher Dunn, an NMSU economics and computer science master’s student. The platform is a database and network app that allows users to invent and share new words and definitions, as well as to track words and phrases that are trending on social media. • Timer Glove, a device developed by NMSU engineering student Mariel Haddad that’s a “smart glove” designed to improve exercise and workout efficiency with real-time monitoring and tracking of weightlifting activities. Koenig said this year’s competition was the largest yet, and all of the participants worked very hard to develop their technologies in a short timeframe. They presented their technology at an April demonstration day for the judges, followed by a reception to celebrate all the work that each team had done. “Our judges all commented on how outstanding all of the projects were and how much they enjoyed learning about them,” Koenig said. He said the judges selected the gyroscope technology because Sanyal, Prabhakaran and Burgett demonstrated great awareness of the market niche and an excellent strategy to successfully get there. Launch is supported by the U.S. Economic Development Administration’s i6 Challenge program, which seeks to support commercialization of the nation’s most promising emerging ideas and technologies. For more information about Launch, visit http://arrowheadcenter.nmsu.edu/launch. For more information about the adaptive singularity-free control moment gyroscope technology, email ascmg.info@gmail.com. This entry was posted in Entrepreneurship News, Faculty News, News, Research News, Student News. Bookmark the permalink. Follow any comments here with the RSS feed for this post. Both comments and trackbacks are currently closed.